In 1861, a man named Henry Griffin found gold near the Powder River, suddenly the area was the epicenter of a gold rush. The rush led to the towns of Sumpter, Bourne and Auburn, and within 20 years, Baker City developed into the center of it all. Between gold and timber, Baker City had hotels, an opera house, a Carnegie Library and grew into the largest city between Salt Lake City and Portland. Mehaffy said removing the plaster and coverings from the building facades revealed a “Pompeii Effect” where buildings looked like they were frozen in time. It motivated her group to apply for grants that the town got back to its historic roots. To promote their efforts, and teach a little history, the group has put together a self-guided walking tour of the downtown area, which gives you not only a chance at learning about the area, but also some great opportunities for shopping. There are no guided tours available. 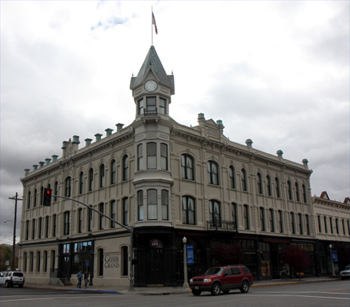 The tour will take you past more than 100 buildings in the Baker City Historic District. As the buildings are restored, plaques are placed on the corner, giving you information about when they were built, and who was responsible for their construction and their importance in the area. The group has also printed up pamphlets that give you a map of the historic district, which are located at businesses, the chamber office and the Historic Baker City Inc. offices downtown. The walking tour pamphlet lists nine major sites to see, but also gives a list of other buildings to check out. In addition it includes a very helpful map of the area and a quick history lesson of Baker City. “The walking tour has been very popular, and it takes about 45 minutes to an hour if you are at a good pace,” Mehaffy said. What I found was that the tour could take significantly longer, especially if you wanted to stop along the way and do some early Christmas shopping or talk with people picking up a coffee. The downtown especially is filled with opportunities to shop in a bygone era – in a town where the largest store is a Bi-Mart – the entire economy is local, so talking with a shop keeper sweeping leaves, or finding out the new jewelry a local artist creates are just some of the unique experiences you can have. In fact, according to Mehaffy, there are more than 162 businesses in the city core, with 142 being locally owned and operated. There are a number of coffee shops, three quilt stores, gift shops, community theater, saddle making shops, antique stores, art galleries, jewelry stores and even a cellular phone store all located along the walk – plenty to keep even the most ardent of shopaholics happy, while tagging along with the history buff in the family. What to bring: This is a walking tour, so make sure to bring weather appropriate clothing, a camera, and comfortable walking shoes. While organizers of the tour say it can take 45 minutes to an hour, you can pace yourself and take significantly longer if you want to shop, talking to local residents and business owners or just enjoy a hot latte in the historic setting. Tip: Give yourself plenty of time, and make sure to talk to people. It’s easy on the walking tours to keep your nose in the pamphlet and read about different buildings. What I found is that when you talk to people, many know the history of their buildings. Also, another attraction to see, which isn’t listed on the pamphlet, but I found it anyway, was a gold nugget on display at the U.S. Bank in downtown Baker City. Located at 2000 Main Street, the bank has a nugget, discovered in 1913, in a display case. It’s about the size of a fist, and is called “The Armstrong Nugget.” Visit the bank for more details, but it is a piece of living history that really shows that Baker City was a gold rush town. Season: You can explore Baker City year round, however during the winter it does snow and have ice. Spring through late Fall (I visited in mid-November and was fine) is a great time to explore. Getting there: The Historic Baker City, Inc. offices are at 2101 Main Street, Baker City, in the heart of the historic downtown for you GPS users, however, those without technology helping them, simply follow Interstate 84 until you hit the Baker City exit (exit 304) take Campbell Street, or Highway 7, until you hit Main Street.